The 2008 baseball season is over. The Sox were eliminated by the young upstarts from Tampa Bay, who then lost the World Series to the Philadelphia Phillies. Honest Sox fans will admit that we went about as far as we could this year with such a battered lineup, but our failure to repeat as Series champions raises a challening question for Joy of Sox readers. Have Boston’s sports fans finally lost their mojo? Is our amazing recent run of championships finally coming to an end? 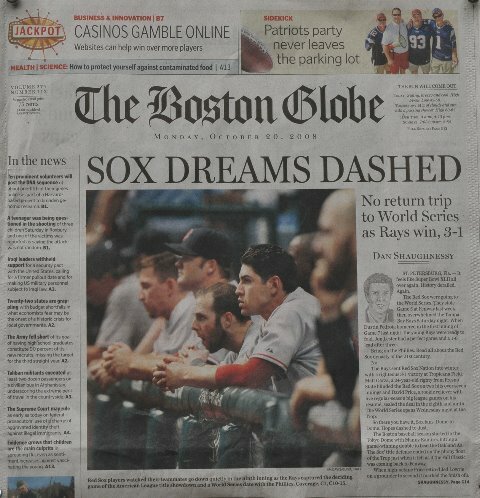 Remember, it wasn’t just the Sox in ’04 and’07; we also had the basketball Celtics in ‘08, the football Patriots in ’01, ’04 and ’05 (as well as two Super Bowl losses), and final round near misses by the soccer Revolution in ’07 and ‘08). Most cities are lucky to get one or two major championship teams in a decade – we’ve had 7 in 7 years. If I’m at all typical of Boston fandom, then we’re all finally ready to take a break from this nonstop state of being on the brink of yet another crucial series. Fans can get burned out, just like players. I for one confess that I still haven’t fully come to terms the Patriot’s Super Bowl upset in February or digested the Celtics’ win in March. My wife says that I eat my meals too quickly, but I definitely like to savor my championships. It sounds like time for the Sox to regroup as a team, and for Red Sox Nation, in fact all of New England’s sports fans, to regroup energetically around the principles of Joy of Sox. Consider this: it’s only October, but already three star Patriots are out for the season with injuries (the leading running back, the defensive team captain, and the star quarterback), the eading scorer of the Rev is out with a concussion, and the Sox season ground to a halt with injury concerns about Ortiz’ wrist, Lowell’s hip and Beckett’s shoulder. The players all seem to be getting ground down, and maybe it’s because we fans are no longer providing them with enough of an energy cushion to bounce back from all their hard knocks. Maybe the Patriots are showing a new model for how to win titles. With their system, it’s not the individual players who count, but the schemes and the play calling and the coaching. The players start to resemble interchangeable parts - if injured 2007 MVP Tom Brady can be replaced by a backup QB who hadn’t started a game since High School, and have the team still be 5-2, then maybe Coach Belichik’s alternative model can also work. He’s emphasized players who subordinate their ego to the team, and who aren’t “characters” that attract media attention. They’re each a little harder for the fans to love (apart from the 3 or 4 stars), and so they may have found a way to replace fan energy by being so mechanically efficient. Not that they’re robots, but the Pats players each fit a mold more than the Sox of ’04 did. And that might be the model of the future.